With five recent graduates teaching abroad on Fulbright awards, Lawrence University landed on a prestigious list of U.S. colleges and universities that produced the most Fulbright students this year. Each year the U.S. Department of State’s Bureau of Educational and Cultural Affairs announces the top-producing institutions for the Fulbright Program, the U.S. government’s flagship international educational exchange program. The 2018-19 list that features Lawrence was published Monday in The Chronicle of Higher Education. Five students from Lawrence received Fulbright awards through the Fulbright English Teaching Assistant Program for academic year 2018-19, tying a school record previously set in 2014-15. Lawrence has had at least one Fulbright student recipient every year since 2006-07. The school has had multiple recipients in nine of the past 11 years. “The designation as a top-producing institution reaffirms that our students continue to excel at the highest levels and that a Lawrence education is well recognized as rigorous, competitive and influential,” Vice President for Student Life Christopher Card said. “That we have earned this distinction is cause for celebration for the whole institution, in part because it is a collective, institutional effort to prepare our students to ‘be the light’ for all to see. Nalee Douangvilay ’18, who studied English, is spending her Fulbright year teaching in South Korea. Augusta Finzel ’18, who studied biology and Russian studies, is teaching in Nuuk, the capital city of Greenland, and studying the effects of climate change on the local population. William Gill ’18, who studied German and government, is teaching in the state of Nordrhein-Westfalen, Germany. Elena Hudacek ’18, who studied Spanish and linguistics, is teaching and leading conversation circles at the National University of Colombia in Bogota. Emilio Salvia ’17, who studied biology and German, is teaching at a gesamtschule, a comprehensive school in Harsewinkel, Germany. Kia Thao, Coordinator of Pre-Professional Advising and Major Fellowships at Lawrence, said the Fulbright honor highlights the numerous opportunities students have to pursue fellowships and scholarships. Being on the list of top-producing schools is notable and speaks to Lawrence’s world view, officials with the Fulbright program said. 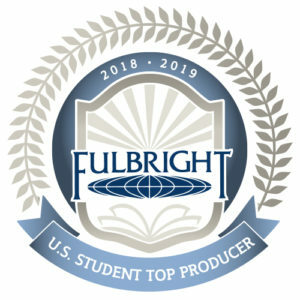 “We thank the colleges and universities across the United States that we are recognizing as Fulbright top-producing institutions for their role in increasing mutual understanding between the people of the United States and the people of other countries,” said Marie Royce, Assistant Secretary of State for Educational and Cultural Affairs. The Fulbright competition is administered at Lawrence through the Center for Career, Life and Community Engagement. Since its inception in 1946, the Fulbright Program has provided more than 390,000 participants — chosen for their academic merit and leadership potential — with the opportunity to exchange ideas and contribute to finding solutions to shared international concerns, according to a statement released by the Fulbright program. More than 1,900 U.S. students, artists and young professionals in more than 100 different fields of study are offered Fulbright Program grants to study, teach English, and conduct research abroad each year. The Fulbright U.S. Student Program operates in more than 140 countries. Lawrence has had 57 student recipients since 1976. The annual application process requires a commitment from the students, faculty and staff, Thao said. The Fulbright Program also awards grants to U.S. scholars, teachers and faculty to conduct research and teach overseas. Eleven Lawrence faculty members have earned Fulbright awards since 1995. In addition, some 4,000 foreign Fulbright students and scholars come to the United States annually to study, lecture, conduct research and teach foreign languages. For more information about the Fulbright Program, visit eca.state.gov/fulbright.